Well, everyone else has a buildup thread, so I figured I would start one also. This is going to be a thread showing what has been done to my truck since the beginning, then will be updated as I continue to work on it. As you read, don’t pay attention to the date stamps on the pictures, they don’t make sense. I have a really hard time remembering to reset it each time I charge the battery. 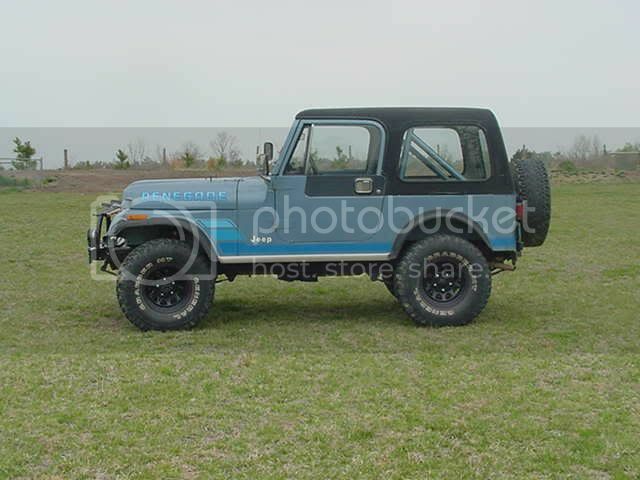 It all started when I had this Jeep. 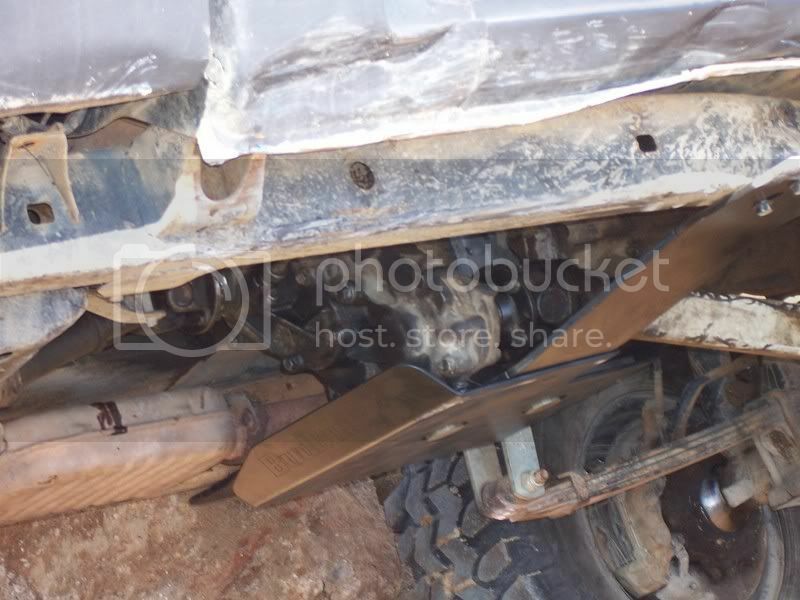 I was wheeling it on the local powerlines and having fun with it, but I knew it was only a matter of time before that weak AMC 20 rear axle called it quits. I figured I could either spend a lot of money on the Jeep replacing parts that were weak, or buy a Toyota for the same amount and already have good strong parts. 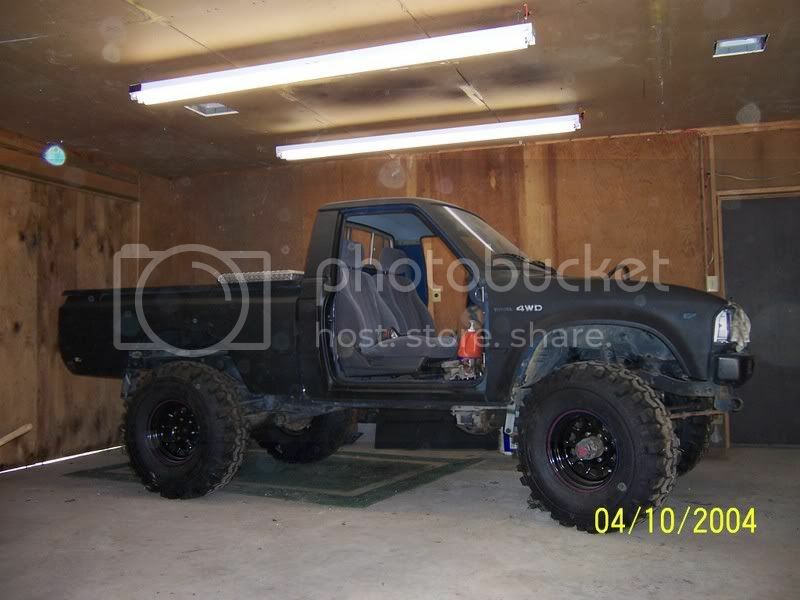 Well, bye bye Jeep. It was fun. Just before I sold the Jeep I had bought my Toyota. It was ugly, but I knew it had potential. 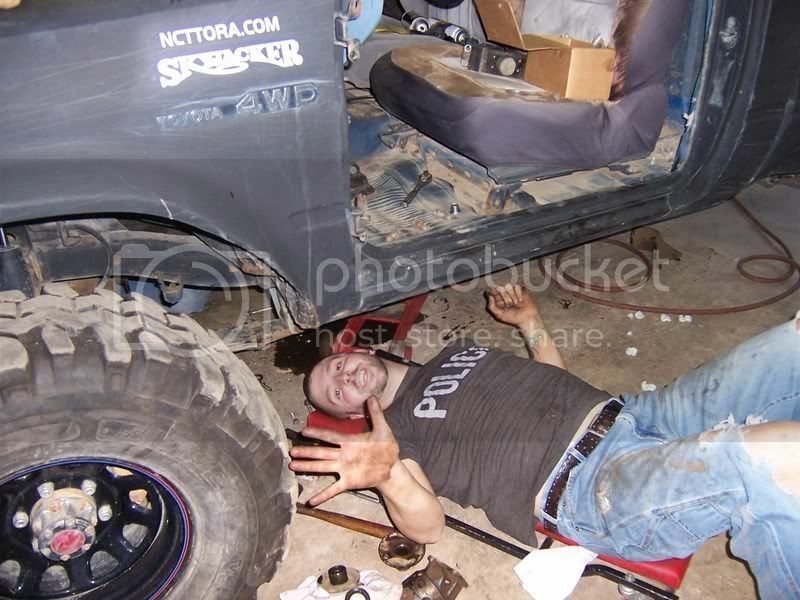 The day I got the Toyota home, the motor started knocking. So what was supposed to be a cheap toy suddenly turned into something more expensive. 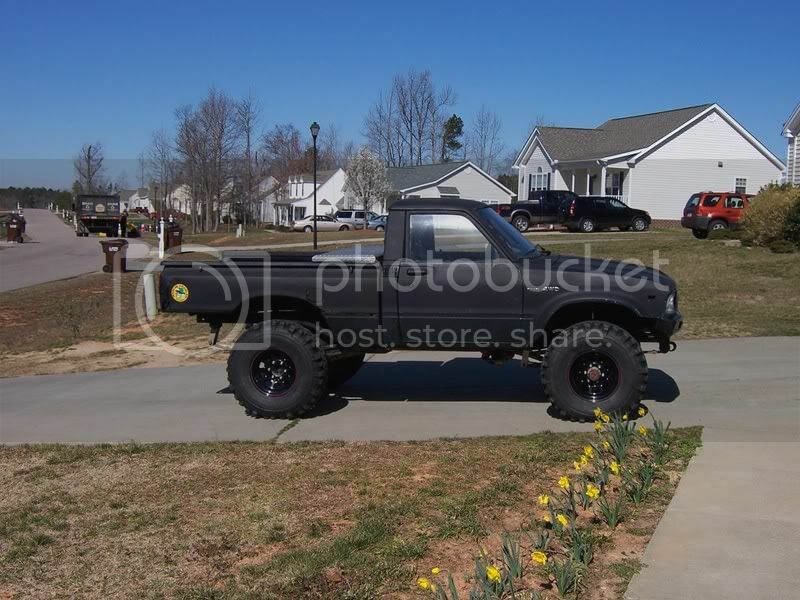 So the money from selling the Jeep was used to start the build on the Toyota. 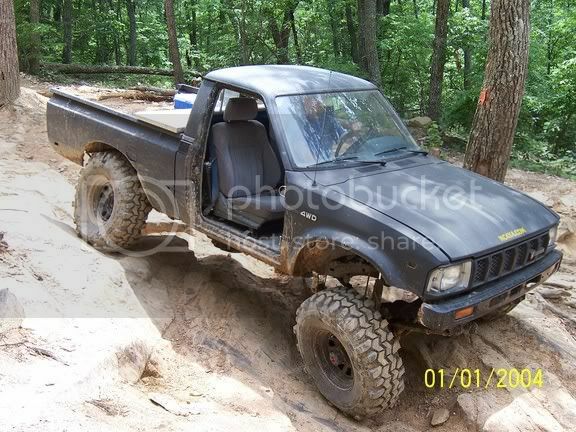 I don’t have any pictures of the Toyota really early, but this is about as old as I can find. It used to be about 4 different shades of blue. 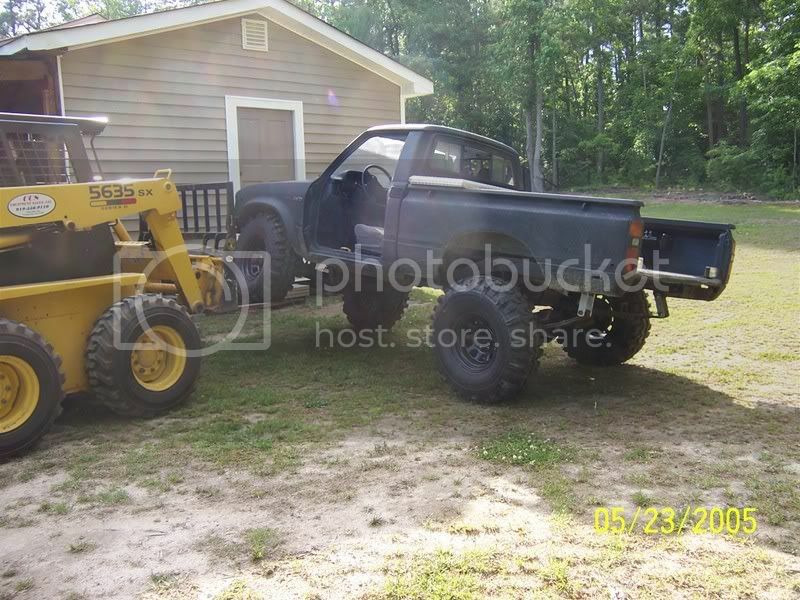 I had the bed off in hopes of making a flat bed, but quickly changed my mind. 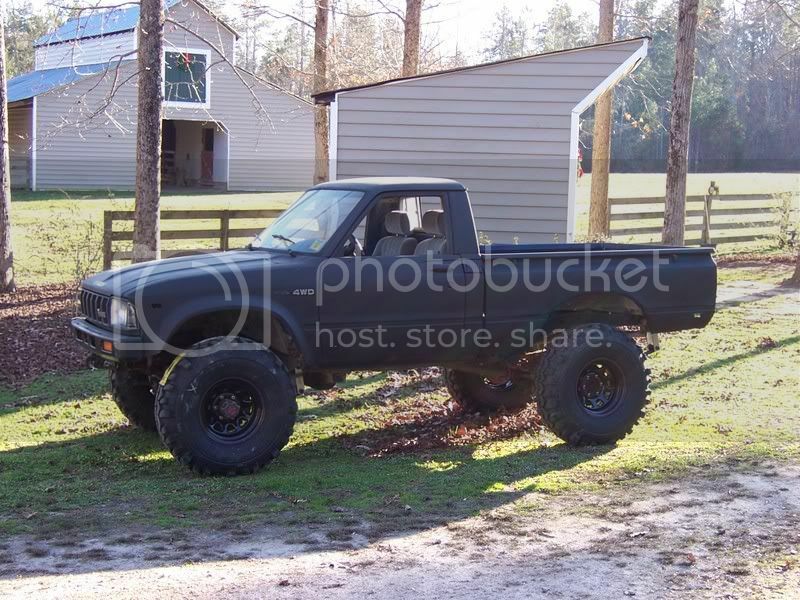 So the bed went back on, a set of longer shackles were ordered, and 33x12.50x15 TSLs on black steelies. I painted the entire truck, and it really looked pretty nice in the beginning. 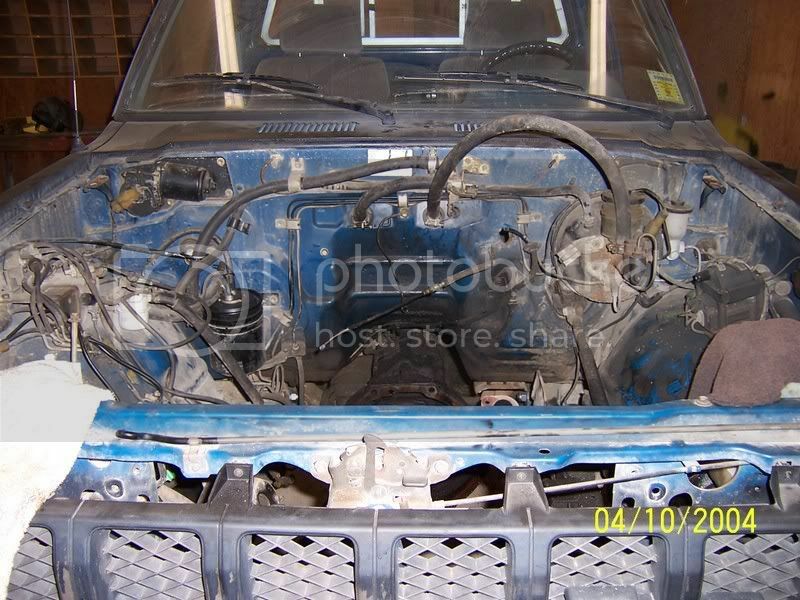 This picture was taken before the engine was pulled for rebuild. 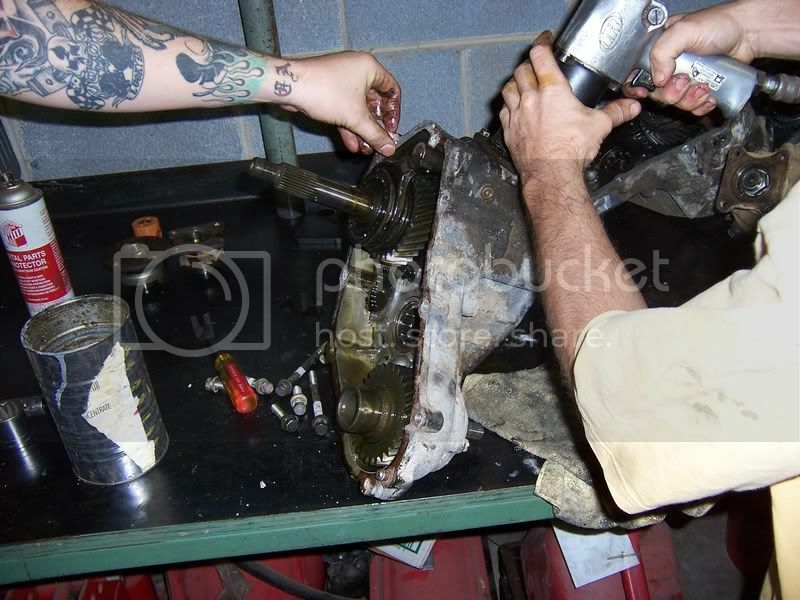 Then it was into the shop to pull the engine for rebuilding. I had a buddy of mine do the rebuild. Lots of new parts. 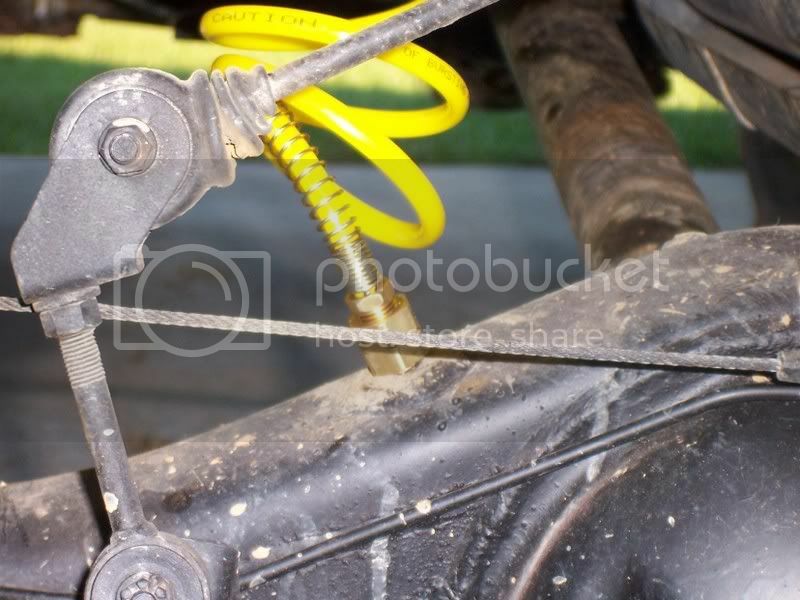 It was bad enough that the original crank had to be replaced. The block was in good shape and was just honed, not bored any. Went back with all stock parts, because in the end, its just a 22r, even with aftermarket performance parts, its still just a 22r. 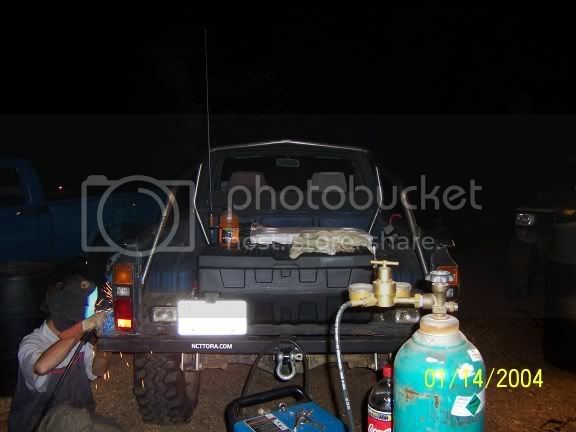 We actually even went back and hooked up all the emissions equipment. All the vacuum lines were replaced and the carb was rebuilt. My goal was for it to be as reliable as possible, and to run good hot, cold, wet or dry. I didn’t want to start taking off emissions stuff that might make the engine more sensitive to temperature or things like that. I just wanted it to run right, power was never a concern. 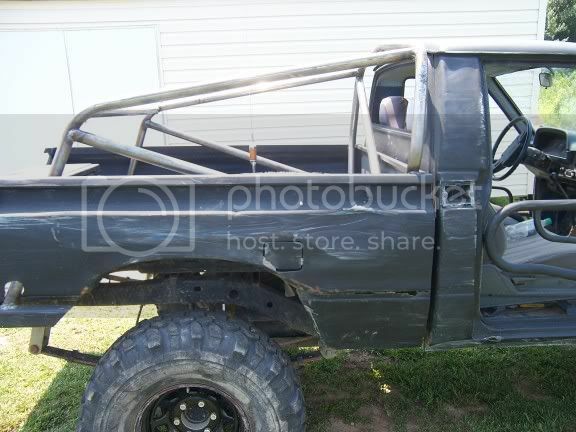 While it was in the shop, the fenders were cut to make the Swampers fit better, and the doors were made quick release. 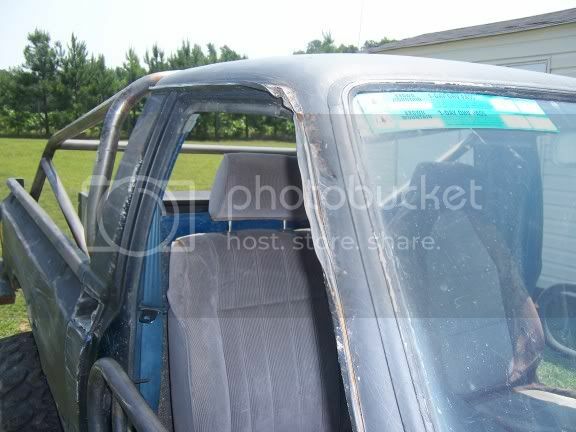 I bolted in the bucket seats out of an 88 Accord from the junkyard, and pulled the rear axle. It was the first time I had pulled the third from the truck, so I didn’t realize I could do that with the axle under the truck. Stupid I know. Well I got the spider gears welded up and would test them out soon enough. 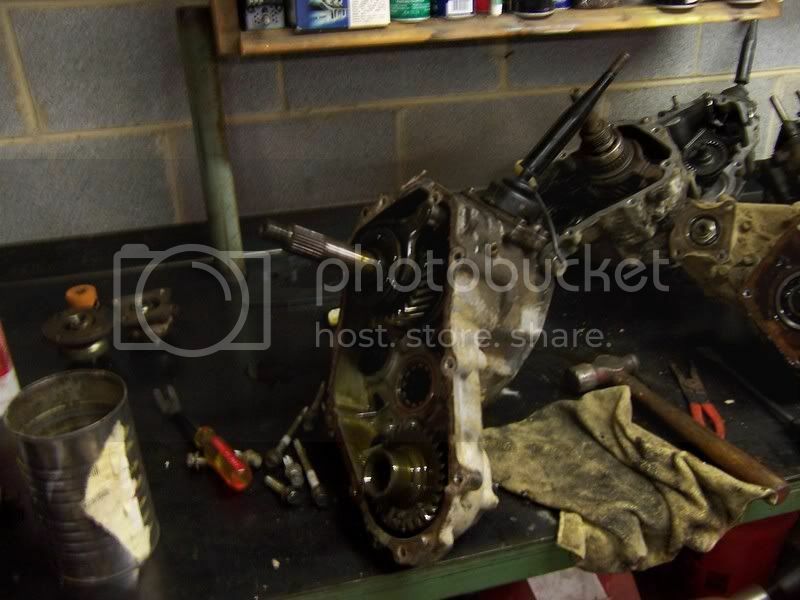 So we got the motor back in, new Zoom Kevlar clutch put in, new slave cylinder for the clutch, new Optima Red top, and hundreds of other little odds and ends. Got it running, did some adjusting and tuning and got it running great. I was super happy with how it was coming along. 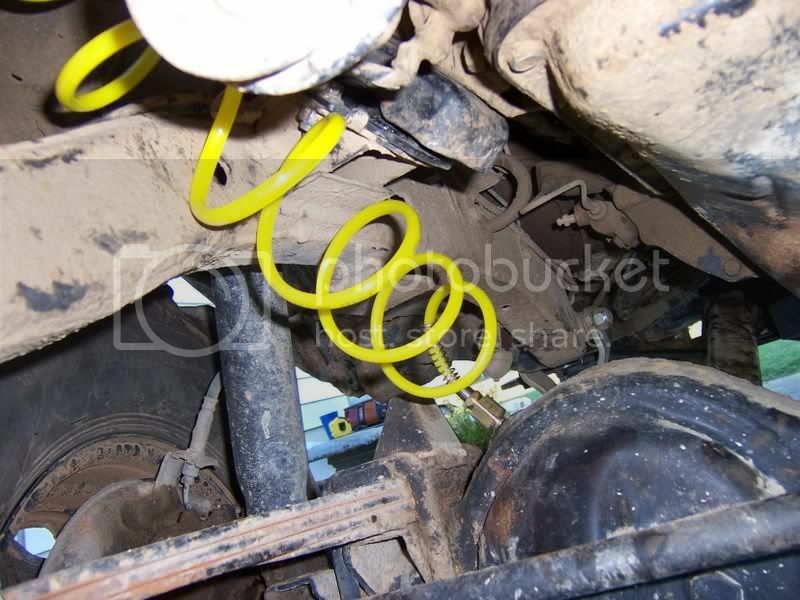 Before I did anything else with it, I picked up a factory power steering setup and got that all bolted up. 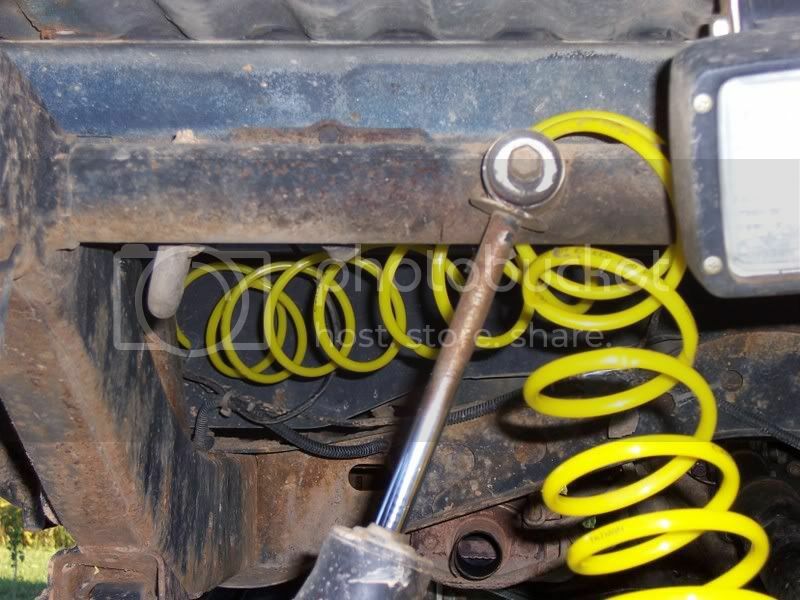 So then it was outside to measure for some new shocks since the old ones were gonna be too short. 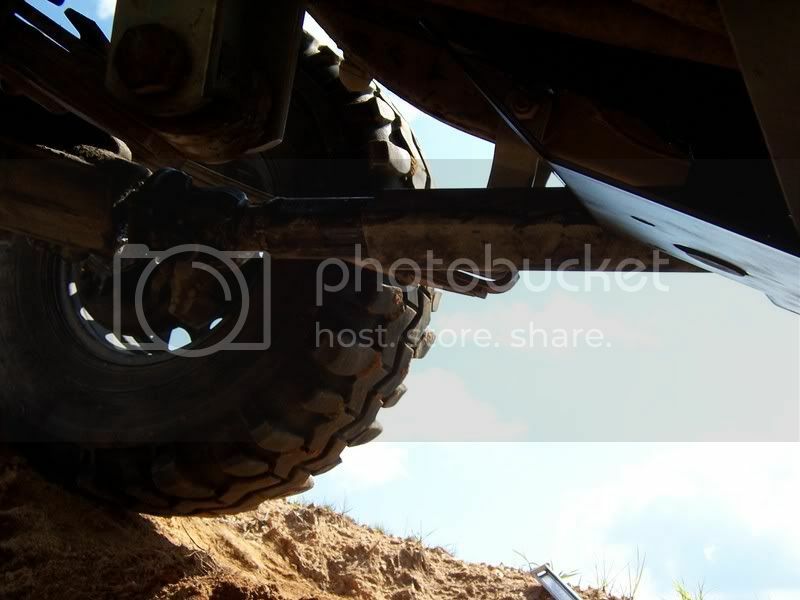 I realized then that my back tires rubbed on the frame, not allowing full flex. A couple of months later I ordered 1.5” wheel spacers from Marlin Crawler. 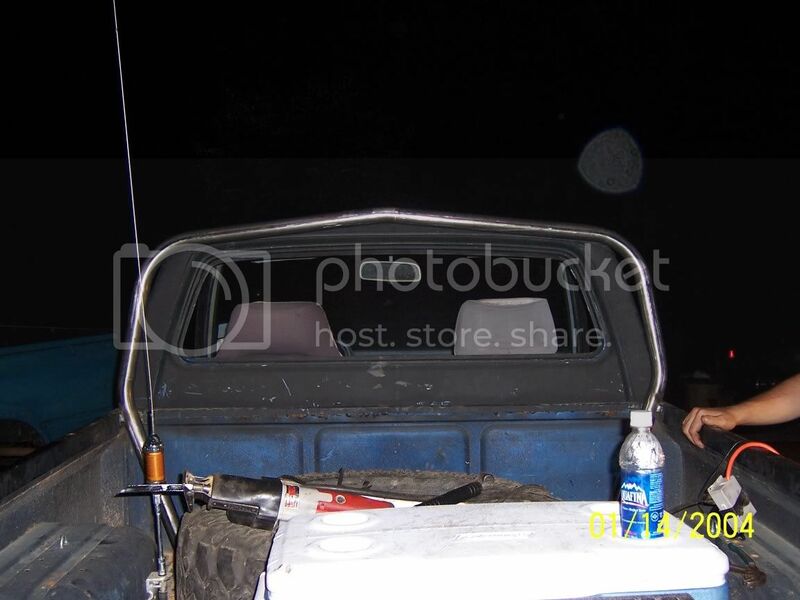 Then, once the shocks came in, there was nothing stopping me from wheeling the truck. 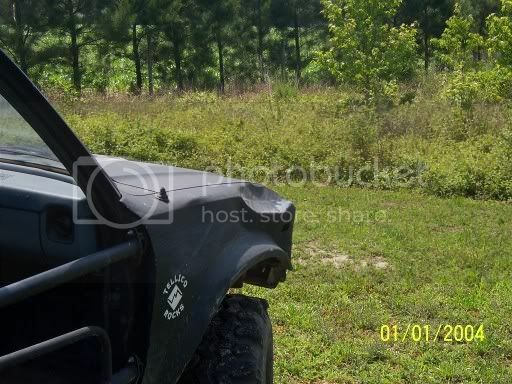 I backed it out of the shop, went down the trail behind my parents house that I had made several years back for ATVs. Went down the hill, turned the corner, started back up the hill, it slid sideways and slammed a tree with the bed. I was slightly upset, but not too much. Turns out this would be my first of approximately 7000 dents in the truck. Now, onto the more fun stuff. It was sometime in mid July 2005. 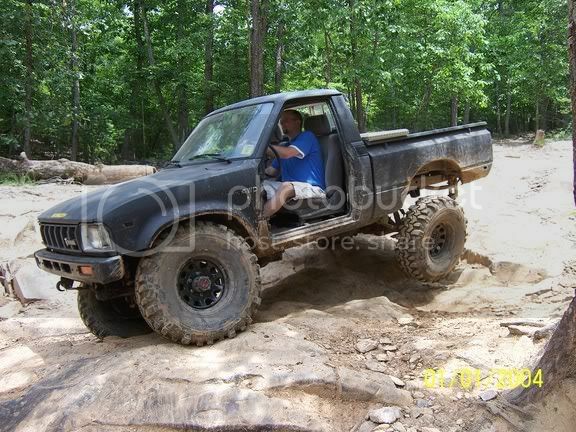 I went on the trucks first wheeling trip. 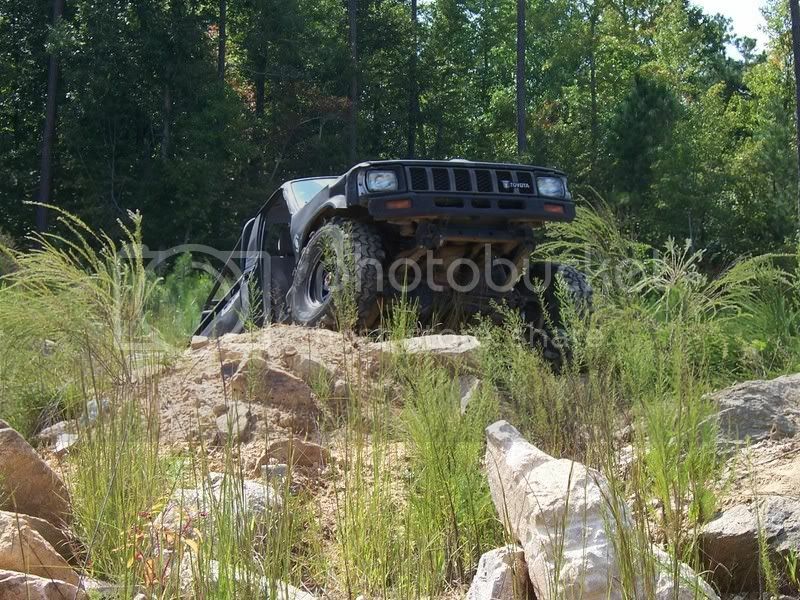 I went to uwharrie and had a blast. 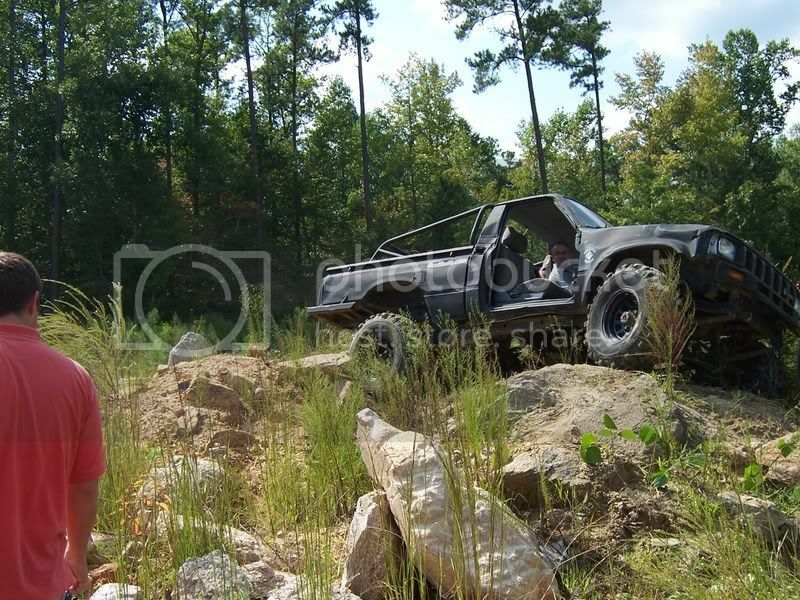 I was so impressed with how well it ran, how cool it ran compared to other things I had wheeled, and how much difference a locked rear and Swampers make. After that I made about 4 other trips to Uwharrie, and one to Brown Mountain. I was also wheeling a lot of local spots. 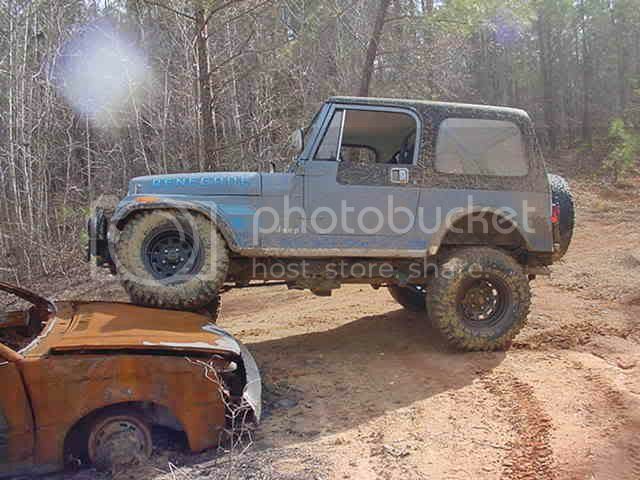 Its amazing how many rednecks you can impress on a powerline if you have some nice tires and a locked rear. I was quickly running out of challenging stuff to do. I was nervous about going to other places to go wheel because I had no friends involved in wheeling, and was not finding any groups I liked to wheel with. Then in February 2006 I joined this board, and everything changed. 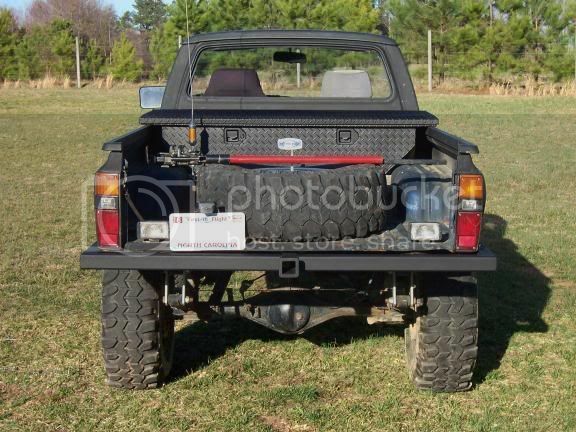 I got the itch to do something about a rear bumper after backing into a rock at Uwharrie and destroying a tail light and the rear edge of the bed. I cut off the bottom of the bed in anticipation of making a bumper. 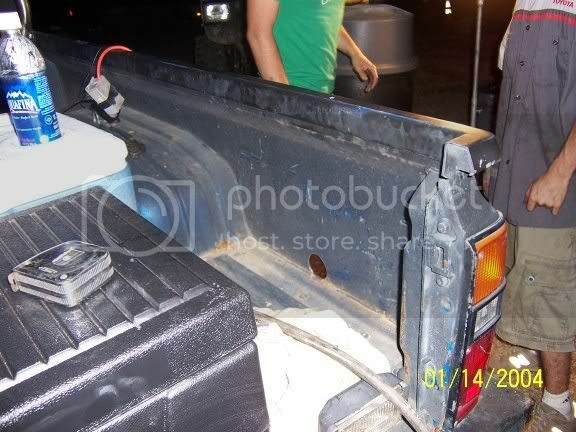 Then I picked up some steal, and my brother in law and I put this bumper together one Saturday. It has held up very well and I would not change anything about it if I had to do it again. Then it was off to test it out and see how strong it really was. 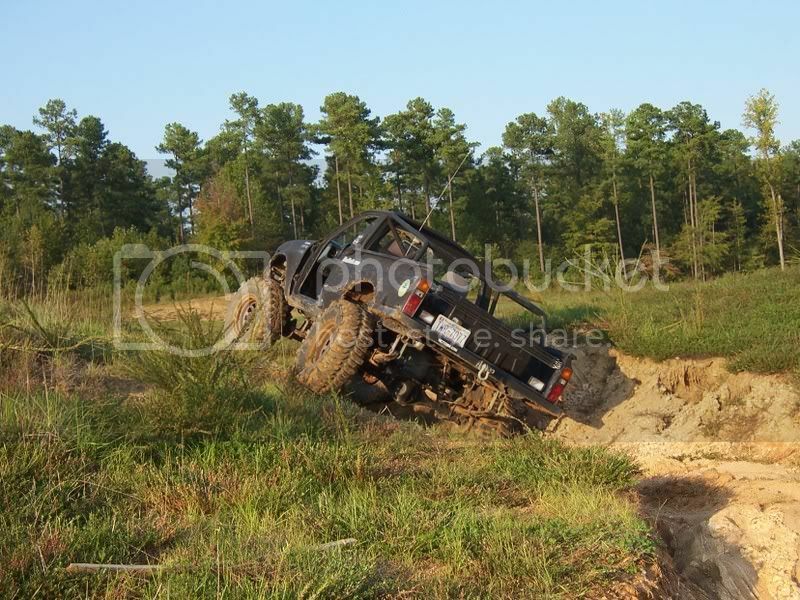 This K5 worked for about 10 minutes trying to get himself out, but had buried himself. He was on 39.5” Iroks and was locked in the rear, so he was definetly stuck. I pulled him out and the bumper held up just fine. 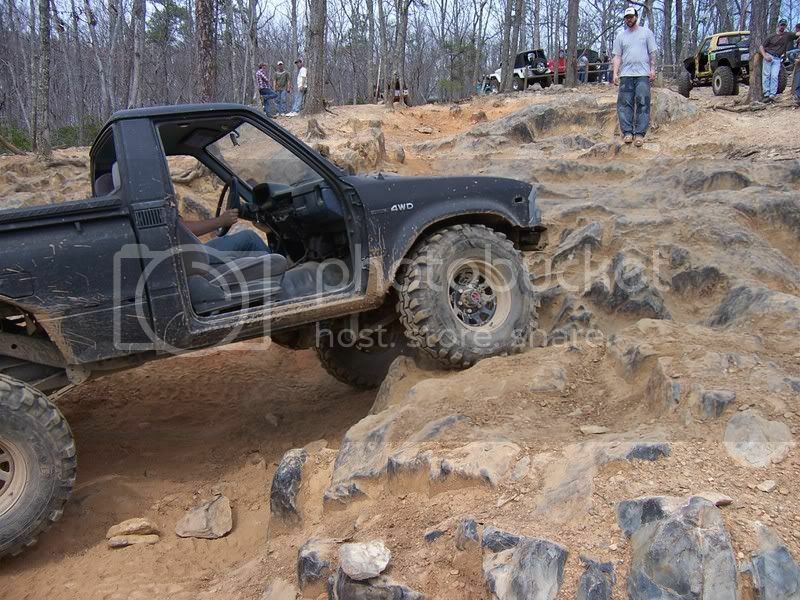 I went on my first ride with NCTTORA in April at Uwharrie. Got to meet a lot of the regulars. Shawn, Justin, Mark, Woody, Robert, Jake, Sleepy, Jordie, Brandon, and more I’m sure were there. Had a great time and finally met a group of people I could and would wheel with. 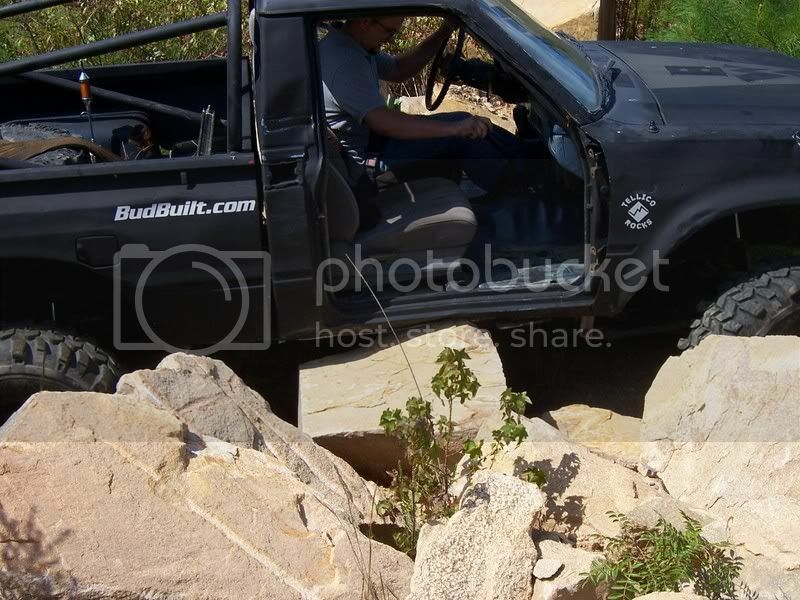 While I was there, I did manage to conquer this portion of Kodak rock and received some compliments on my truck. Well, after that the truck went to Whipporwill, Tellico and Brown Mountain. 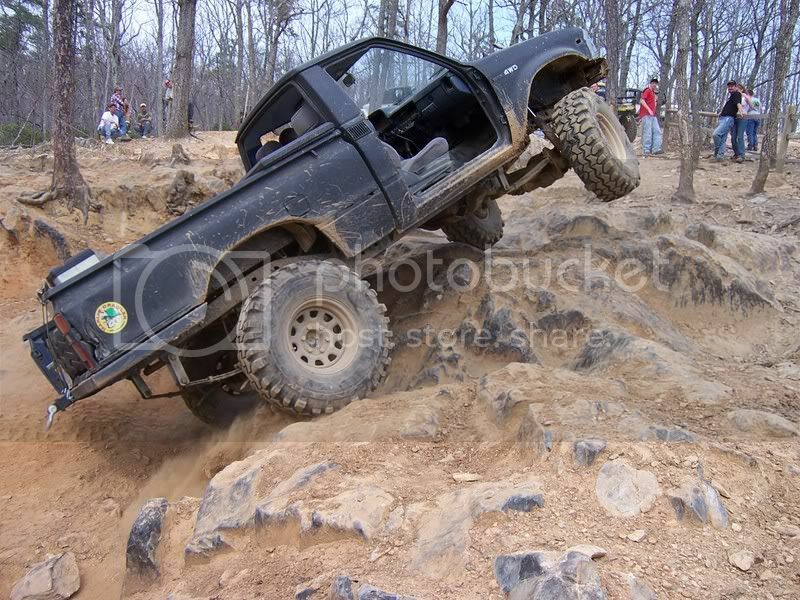 At Tellico the truck ran Slickrock with only a locked rear, and almost made the ledge past slickrock. After riding at Tellico, I realized that the possibility of me rolling was starting to get higher. 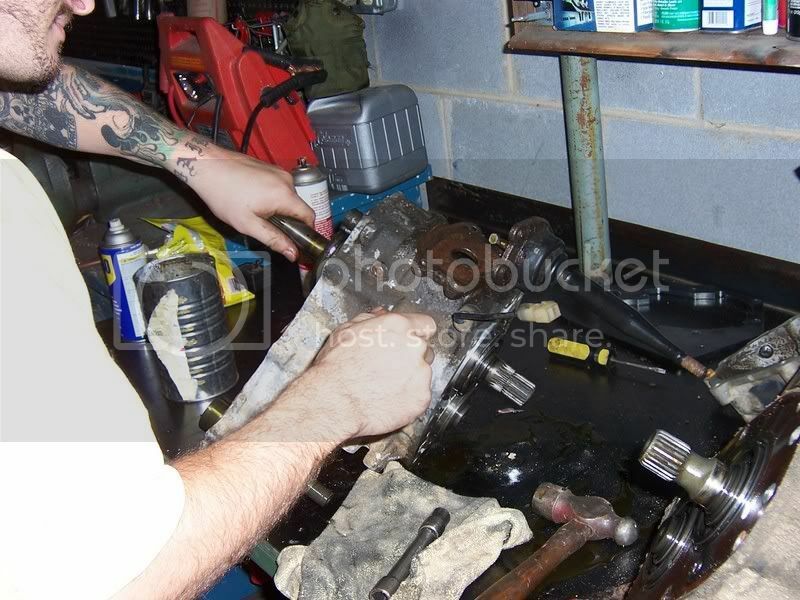 So, I bought some tube and went to Justin’s house to be the first project with his new bender. 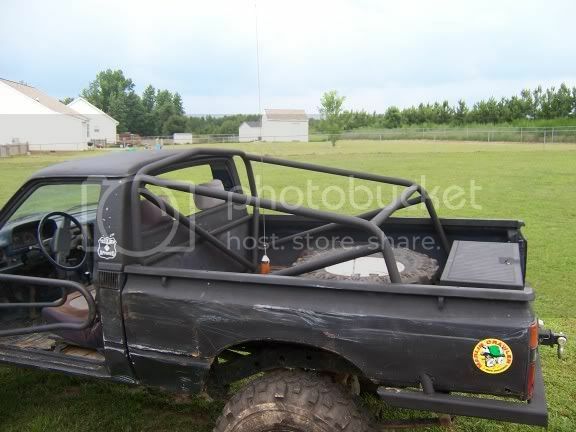 After we finished the cage, we went to Brown Mountain again and suffered quite a bit of body damage. It was a trip that I was glad to be done with, and I had less damage than anyone else. Jeff and Justin both suffered a lot of damage. Then one eventful trip to Harlan, lots of drama leading up to that trip, but it all turned out ok in the end. Next was the dual cases. 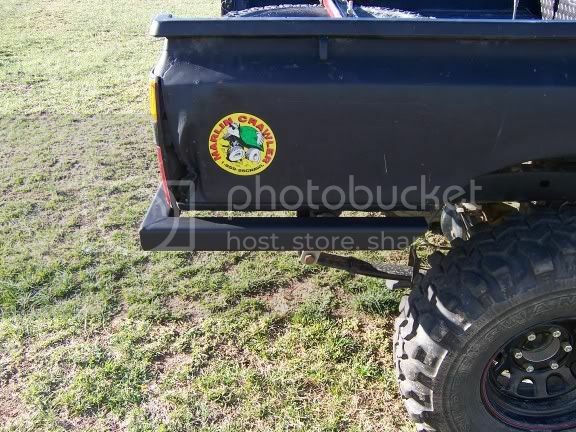 I was tired of banging my way over rocks. The only way to slow yourself down is to ride the clutch, and that won’t last long. So I bought a spare case, a dual case adaptor from Marlin, and a Budbuilt Crossmember and Skid plate. The crossmember raised the drivetrain an inch, and the design of skid plate gives 2.5 inches more clearance than factory. So that equals 3.5” more clearance than before, awesome. 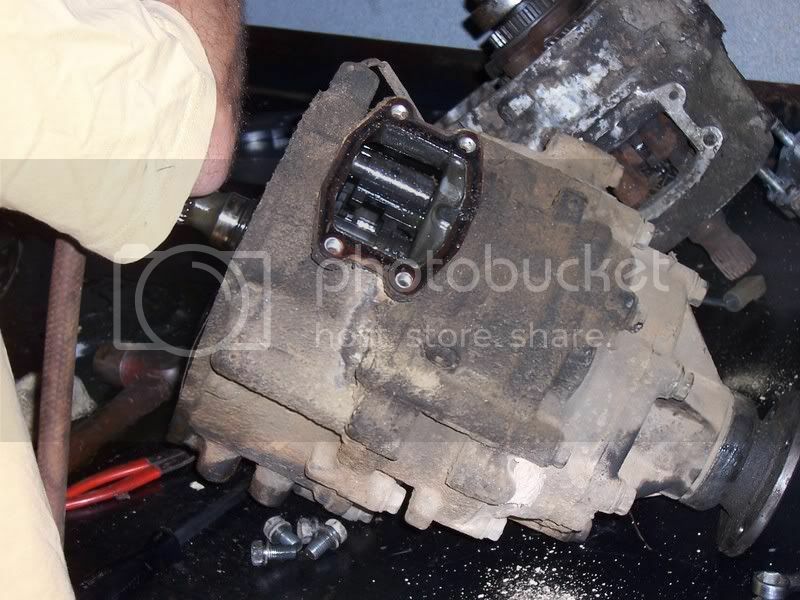 When we put in the cases, we also put in a square front driveshaft that is bombproof. The cases work awesome. By far the best upgrade I have made to the truck so far. While out testing the new cases out, I managed to rip a hole in my front TSL…. 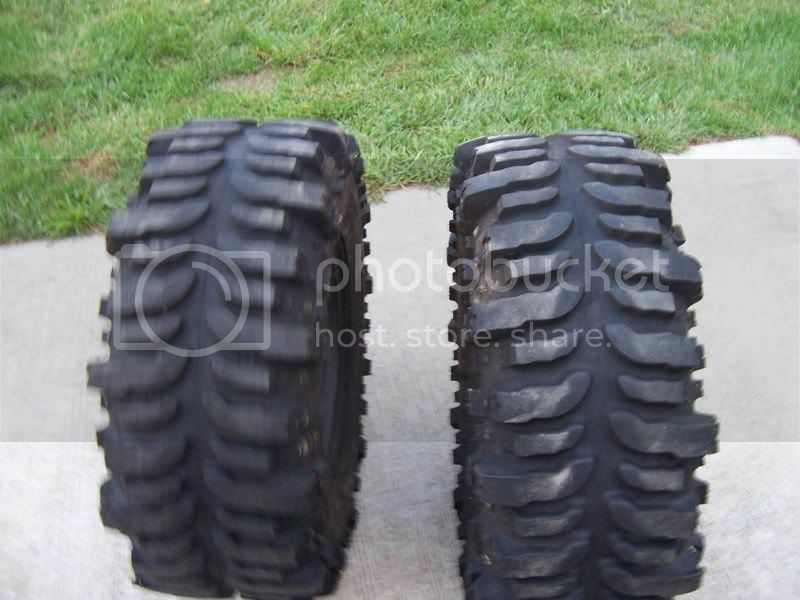 So, I decided to move my two good TSLs from the rear to the front and picked up a set of almost new Boggers for the rear. 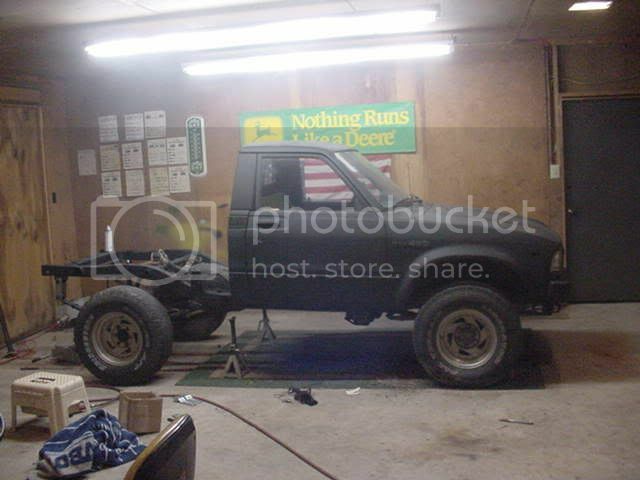 And here is the truck as it sits right now. More mods are on the way. 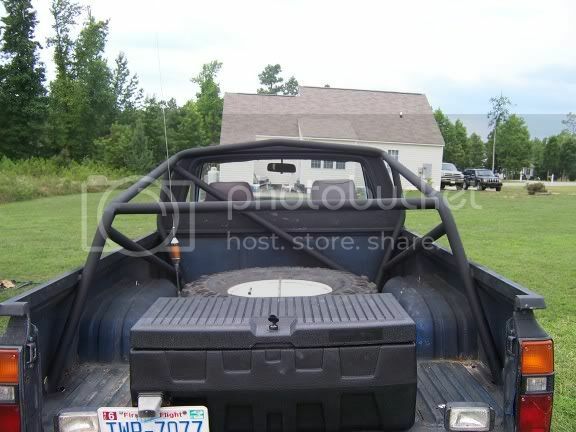 Soon it will be locked in the front. The list keeps going from there, but we will worry about that later. Well, Yall have fun. I'l be back Sunday. I'm leaving to go to Tellico for the Dixie Run with Woody. Be good. Cases and cages By: UNBREAKABLE! 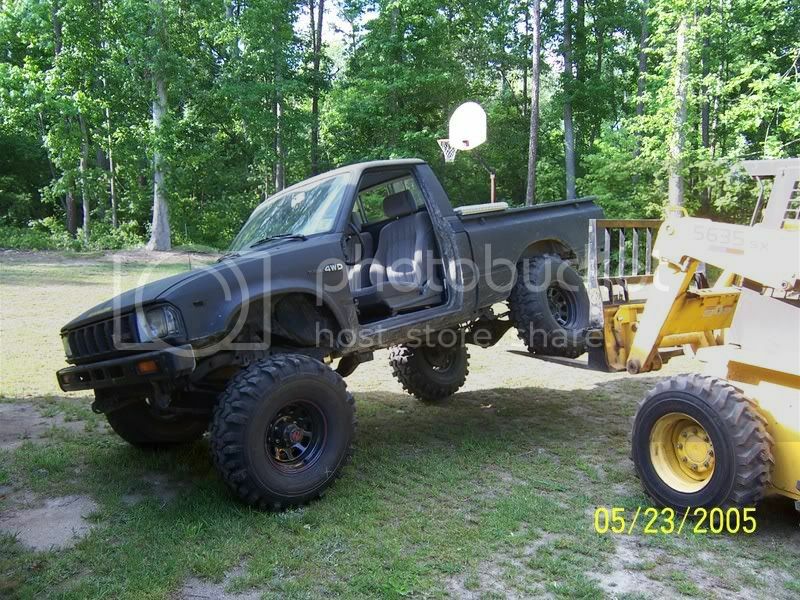 The truck has come a long way...Take it to 3rd base now ROLL ON ITS SIDE! 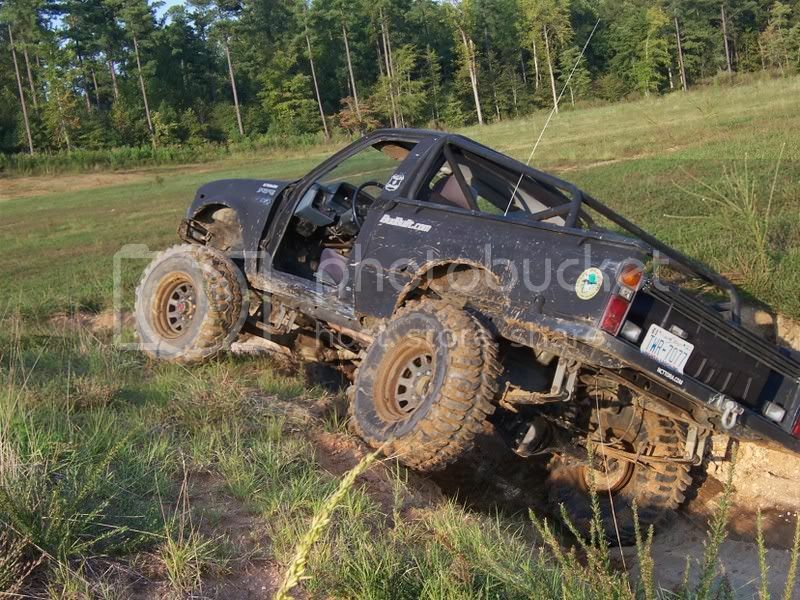 Lets see some pics from the dixie run when you get back. This is a really cool thread. I'm wondering what you'll do next? Locker in the front? What's next, what's the timeline? Yep, locker in the front is going to be here for Christmas. After that....well, i have some ideas, they involve some tubing to be bent, but im gonna keep that on the downlow until i figure out what exactly i want to do. 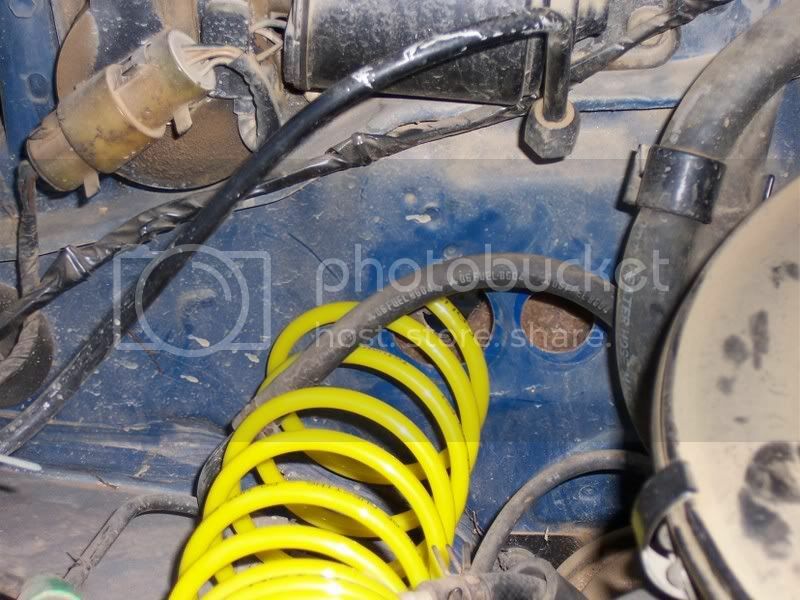 Short term stuff is, extending my diff breathers and possibly a U-bolt flip for the back. I cant flip the front bolts yet because the ubolts will hit the stock steering. 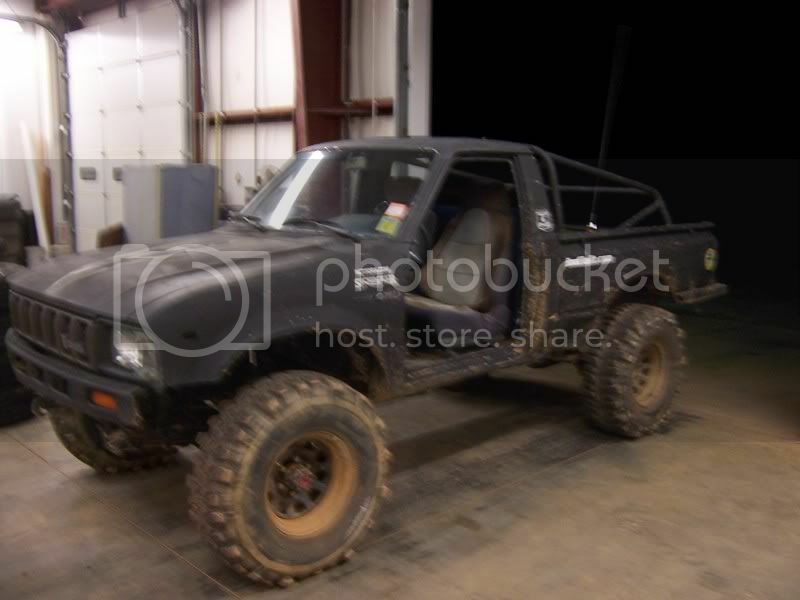 Really long term stuff will be, Crossover steering, some kind of different springs, not really sure what kind yet, bigger tires, then im calling it quits. I had you in mind when i wrote that. Yeah, check out this thread. It was a wild day to say the least. I'm just saying that incase Pam decides to read the forum. The mods will never stop. i know i have the addiction, and i must feed it. I also forgot, another soon to happen mod will be some diff armour. 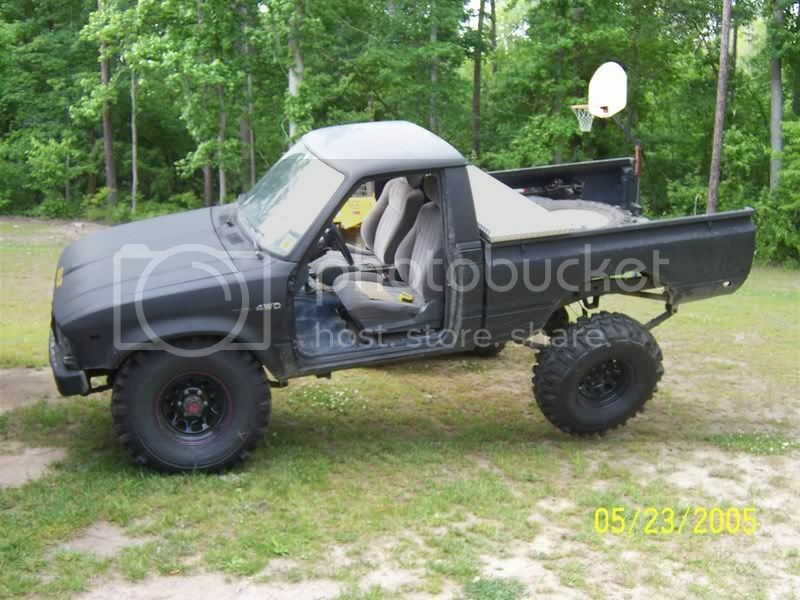 I know i am just begging for trouble bashing around in the rocks with 33s. I hit the diffs on everything. 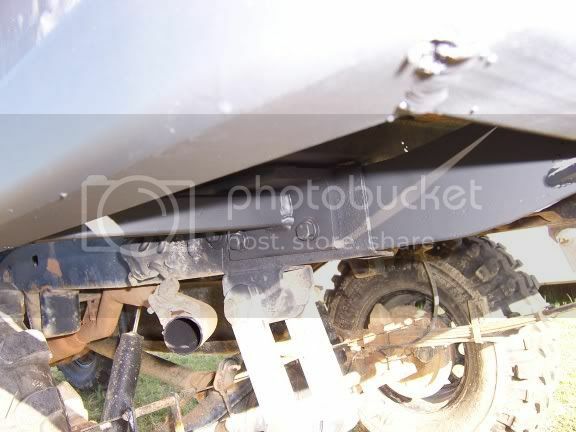 Umm, it will either be bought as diff armour or bye a pipe cap and cut it in half to use on both axles. OK, did the diff breathers today. 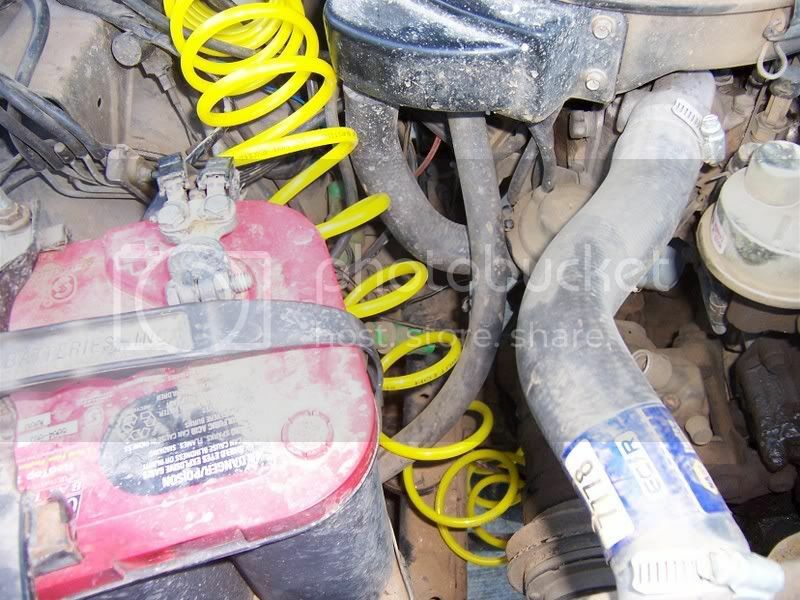 The factory breathers are a metric thread, but it is very close to #2 Pipe thread (1/8"). So i found a coiled rubber air hose at Walmart for like 8 bucks. It was 25 feet long and had #4 pipe thread (1/4") ends on it. I cut it in half so i had two sections. I found some #2 to #4 adaptors and put everything together. I ran both breathers into the cab. 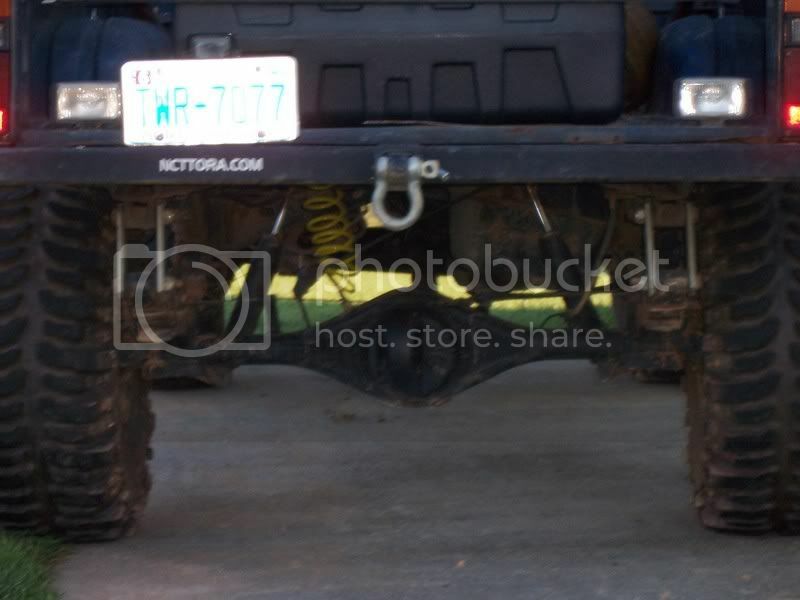 So about the time my waist goes underwater, so do the diff breathers, that should be deep enough. 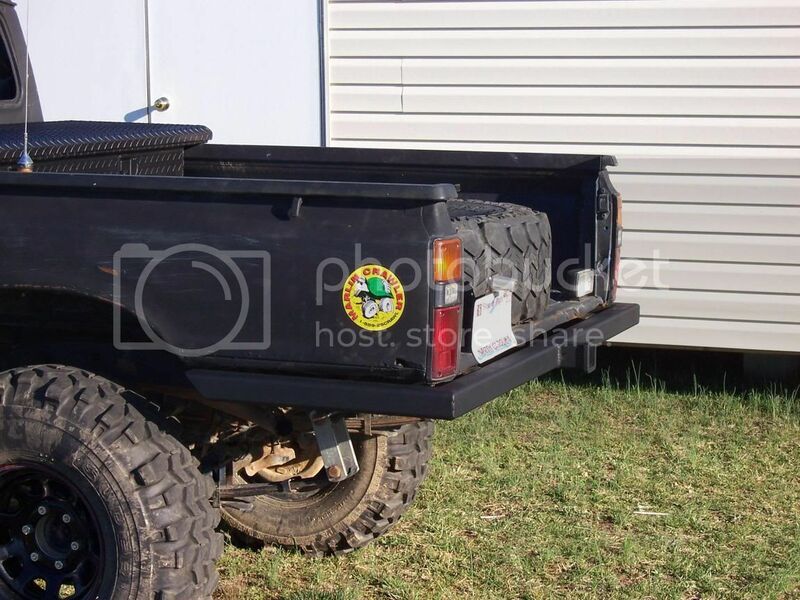 The rear is run about half way up the back wall of the cab. 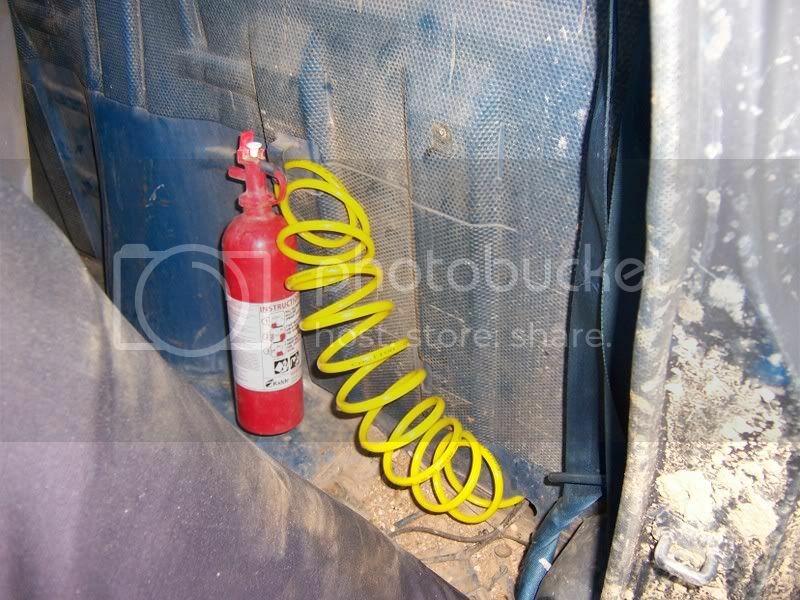 The front goes though the firewall and ends back behind the glove box.